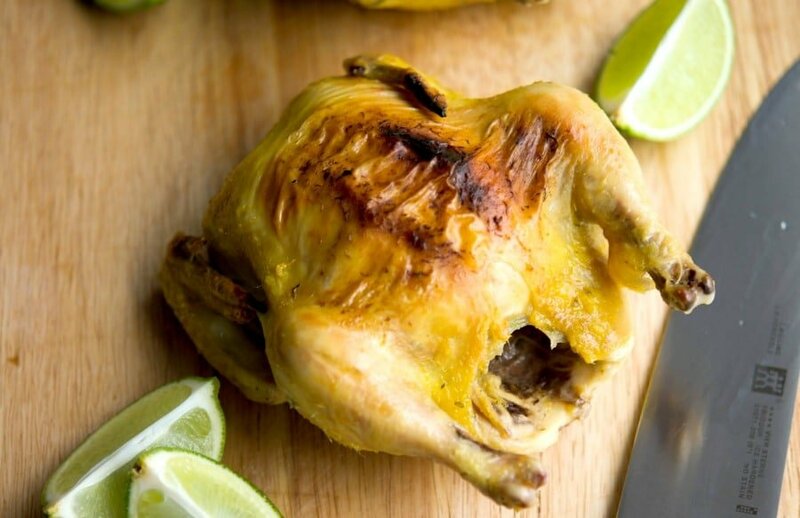 Cornish Hens marinated in a brine of fresh tarragon and lime juice are a healthy, tasty alternative to roasted chicken for those busy weeknights. I don’t make cornish hens often, in fact the last time I made them was when I made the Lemon Roasted Cornish Hens back in May 2012. I don’t know why I don’t make them more often as my family, especially the girls, love them. In fact they used to call them “little chickens” when they were younger, but now that they’ve matured, they’ve penned them “pre-teens” and since the U.S. Agriculture describes them as “young immature chickens” I guess I’d have to agree with their terminology. For this recipe I made a brine with fresh tarragon, lime juice and zest; then let it refrigerate for a minimum of 6 hours. The flavors infused with the brine were wonderfully light and refreshing and the brine made the meat extremely juicy. 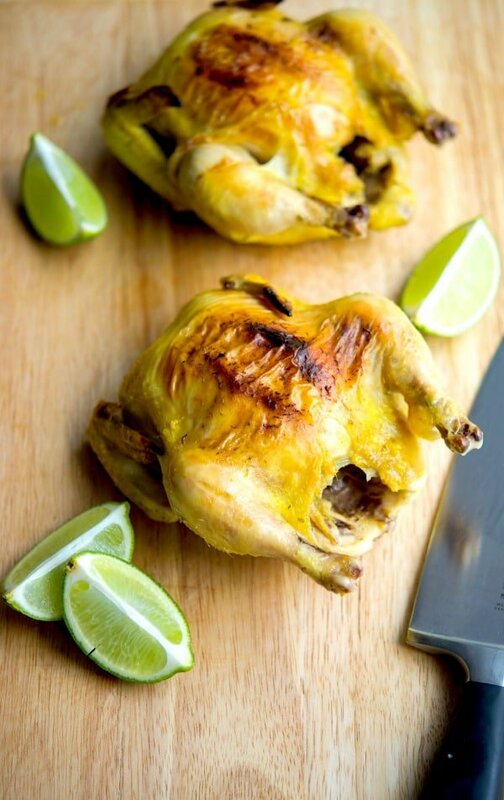 Cornish hens also make the perfect “date night” dinner as one bird is enough for two people. 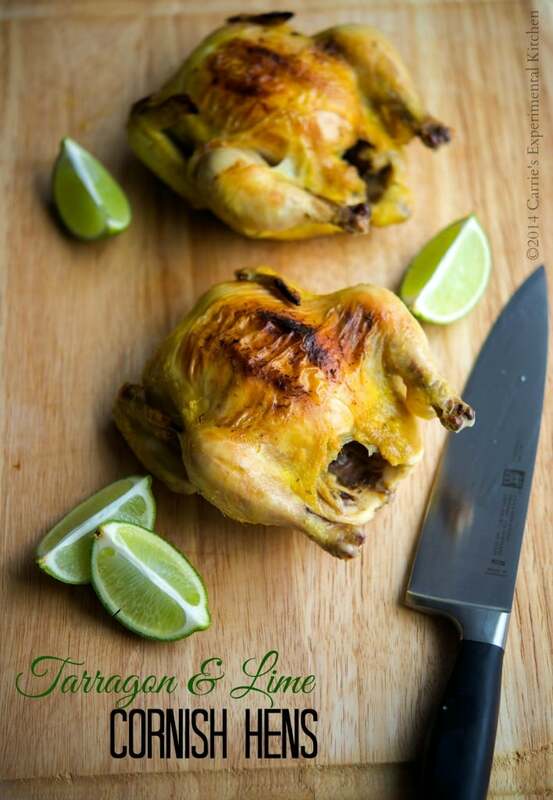 They take about 1 1/2 hours to cook or until the internal temperature reaches at least 165 degrees F. Serve these Tarragon & Lime Cornish Hens with Honey Lime Glazed Carrots and rice and dinner is served. ~Enjoy! Combine the salt, sugar, lime zest and juice, tarragon and water in a bowl and whisk until the salt and sugar have dissolved. Remove the innards from the hens and discard; then place them in a resealable plastic bag. Add the brine mixture to the bag, seal and refrigerate the hens for a minimum of 6 hours and up 24 hours. 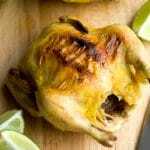 When ready to roast, preheat oven to 350 degrees F.
Remove the hens from the brine and place them in roasting pan. (If you want gravy with them, add some chicken broth, water or wine to the bottom of the pan to mix in with the pan drippings). Bake for 1 1/2 or until the proper minimum internal temperature of 165 F degrees is reached. Remove from oven and allow to rest for 10 minutes; then cut the hens in half down the center forming two halves.